Investor Testimonials | NEoWave, Inc.
"My trading is based on Neely River Theory. This year I will end with a 50% return." "Great and transparent communication, Glenn. What I love about your approach to markets is your greater emphasis on making money than on being right. While being right is important and the primary objective of most forecasters, your emphasis on successful trading and making money is actually what makes you a world-class forecaster as well." "Glenn, the time has come – the villa is finished and I am flying over to move in. I received full citizenship of Europe and am currently a Swiss citizen, with approval of all social benefits. 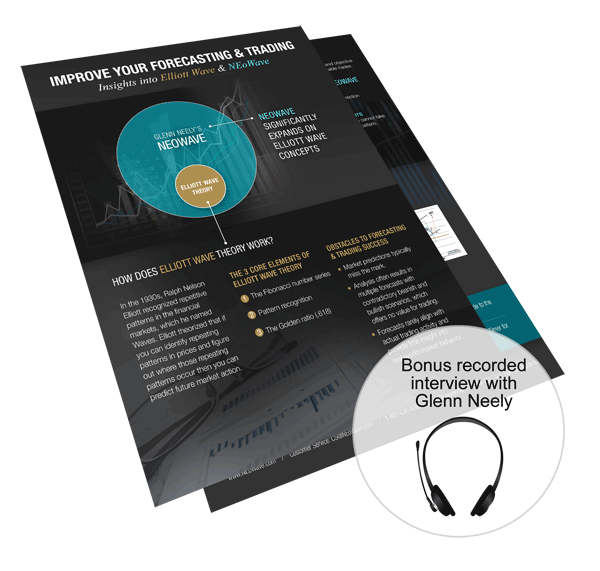 As I look over all the years I have used your NEoWave Forecasting method to predict the market – and your Mastering Elliott Wave book that has guided me, along with your course – I must thank you. Without your guidance, I would never have made the fortune I have." "I've subscribed for about a year, and your trading service has been the source of my two most profitable trades ever. They had such a positive impact on my account, I can retire sooner - this during a period when most people are having to push back their retirement date!" "Glenn, I have followed you for over 29 years. Initially, I disagreed with your assumptions but discovered that I was wrong and you were right. More important, I have made money." "I have made a return of 17% (52% annualized) in just four months using Neely River Theory. Prior to using NRT, in the first six months I was up 30%, then lost all these gains and went back to break even. I then took a break of two months and started trading again and clocked the above return – all thanks to Glenn Neely's guidance in using NRT. Following Mr. Neely's advice, I now log all my trades, so I know how many trades I made, when the trades were executed and when exited, which trends were profitable, as well as other parameters. Thank you for everything." "You provide an excellent service. And you're helping me reach my financial goals." "I've been trading for many years, and the techniques I've used in the past are not working in the current market. Thanks for helping us navigate the extreme market conditions we are having." "I remain amazed at your analysis during this historic bear market. Keep up the tremendous work." "I have been very impressed with your calls of major turns, which have been in opposition to many (if not nearly all) other forecasters. That takes courage, a lot of courage. Few market forecasters come out with clear forecasts. Usually they hedge their bets, like weather forecasters in the old days: 'It may rain today, but it may not.' Before meeting you in Sydney and reading about your interpretation of Elliott Wave Theory, I was a great skeptic of Elliott. One could get interpretations that were diametrically opposed! You've saved the bacon for Elliott as far as I'm concerned." "Things are going great since my Neely River Trading classes. My average winning trade has been more than 3x my average loser, so I'm on pace for about a 38% annualized rate of return, based on the results so far. Plus, Neely River has provided the easiest, least stressful trading I've done in my life. I don't have to work as hard to find and monitor my trades. It's nice to look at a chart and, within minutes, know if it's even an option for a long or short. This has been big adjustment, as I was previously spending many hours or many days reviewing just one stock to determine where and when I would go long or short. I have a tremendous amount of new free time thanks to NRT, which allows me to enjoy other things in life. Also, the stress level is extremely low or even non-existent, since I feel no pressure to make a new forecast so the trades continue to go well. Best of all, I'm not worried that at some point in the future I'll have to endure a large drawdown of my portfolio. Many of the trend-following systems I've studied have some impressive long-term returns, but they also include periods of drawdown as large as 50-60%! I do not want to go through a decline of that magnitude, and I don't have this concern with NRT -- you'd be stopped out of your trade long before that happened. NRT was a great investment, and it should pay dividends for years to come. I plan to continue working with Neely River and trading it full time. Glenn, I can't thank you enough for teaching me this system." "I've been your customer since January 2009, and I like the service very much. My trading results have improved dramatically thanks to this valuable information!" "I am very impressed by your ability to manage risk. That is what it is all about. Lowering your stops recently on the S&P trades to lock in 20 and 30 points of profit is a perfect example of this. The call you made in early March of 'an explosive rise dead ahead in the S&P of 100-150 points,' prior to the March 6 intra-day low is the single best call I have ever witnessed." "I was with an Elliott Wave competitor, but I cancelled that subscription. Their forecasts were constantly changing from bullish to bearish - almost daily - and this was whipsawing my account. There was always an alternate count or scenario (usually the exact opposite of the original forecast), which was used if the first assumed count did not pan out. I'm glad to know NEoWave doesn't offer alternate scenarios. I am new to the NEoWave service, recently purchased Glenn's book, and I have started going through it." "I understand the right money management approach by simply following your trading product. Your updates reflect the way you think as a trader - not just technical entry and exit levels. Plus, your approach broadens my perspective of the market. Every word you say is enlightening as I find your approach quite revolutionary!" "I've been a subscriber for a short while and have already gained quite a bit of knowledge from your trading style. I subscribe to several newsletters, but almost exclusively trade based on yours. I have learned a great deal from your entry and money-management techniques, which reduce and limit risk. I am grateful to have such a competent advisor during this historic and fascinating market." "Thank you for sharing valuable market forecasts. Your forecasts have been exceptional over these last 20+ years. You are a treasure to us old guys - I've been trading for 52 years." "Well done with your trading service. I have made more money this month than ever before. Your predictions have been spot on. I use them in conjunction with my indicators and it's been great, especially in these times of high volatility." "I loathe the 'cherry pickers' (unnamed, but famous) who publish a horde of charts and later point out the few that were prophetic. Somehow the charts that miss the mark are never seen again. Glenn, you do consistent, same-chart updates. While others in your business spend time marketing promises, you deliver the goods. I am in fat double-digit gains for this year and last. I was schooled in 'traditional' Elliott Wave - 20 years of bad habits - and initially doubted your analysis, but no more. Glenn, you are the Brett Farve of forecasting." "Glenn, I have known you for 20 years. No one comes close to you in market prediction and market understanding." "Your sincere effort to help us to preserve our capital has been much appreciated by all readers." "Your July report hit it right on the head. You suggested an economic meltdown, and we approached it last week! Your calls have been brilliant! Keep up the good work." Director, Cycles Research Institute, Inc.
"Thanks for the great trades you provide on your S&P trading service. I use the hourly trades - and I am smiling!" "I own my own company, and I use your updates for more than just trading. I have been able to guide my company during these tough times." "Your predictions of the direction of the S&P over the last few months have been incredibly accurate. I'm glad to say I have followed them all. Thank you." "I've had the pleasure to watch Mr. Neely for over 20 years. He was on the button then and still is. My wife and I want to thank him for sharing his knowledge and wisdom. 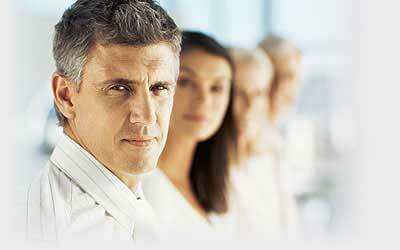 We appreciate his incredible due diligence and old-fashioned, take-care-of-business attitude. Thanks a million!" "Kudos on a great trading week - the timing was perfect. We're cruising around Italy on a luxury cruise line, and I have half the short still riding with a close stop. What I took from the table with the other half more than paid for our cruise, even as we considered whether we could really afford it with two kids in college." "I very much appreciate your work. Mastering Elliott Wave is an important book in my technical analysis education." "Thank you for attending to the emergency updates during this crisis! While I love the regular trading updates, I can't think of anything else I would want you to be doing than helping us watch out for market whiplash! I appreciate your excellent work in Wave analysis." "Thanks for your perspective. I've known you for 20 years and you are the best and my most admired analyst/technician. Your insights and visions are clear and based on sound fundamentals and logic - and are always so accurate. I'd say your batting average is close to 800 compared to an industry where 400 is the average." "I think you are a genius when it comes to wave counts. I've been a very successful investor using Elliott, and a lot of my knowledge comes from you. I apply Elliott to small cap stocks and have made a fortune." "Don't bother about the skeptical 'gurus.' I highly appreciate your work, just keep it up!" Trading Post Financial Services Inc.
"I was listening to an audio update you gave in 2004 about your views on the markets. You are clearly one-of-a-kind (genius material? ), so I pay lots of attention to what you say! I'm glad to have studied with you. I see that the other Wave analyst turned bullish - his methodology is very simple and straightforward, so it's easy to see what he is thinking." "For the first time in 5+ years of studying Elliott Wave I have been able to get working counts on just about anything. Reading your book and your questions of the week - as well as reviewing some of your archived stuff - were the catalysts. I'm 24 and appreciate getting your material at such an early stage in my learning." "Thank you for teaching me so much. Trading is stress-free. Everything is working on auto pilot. Entries and exits are being taken across all my portfolios without any emotions and prediction. 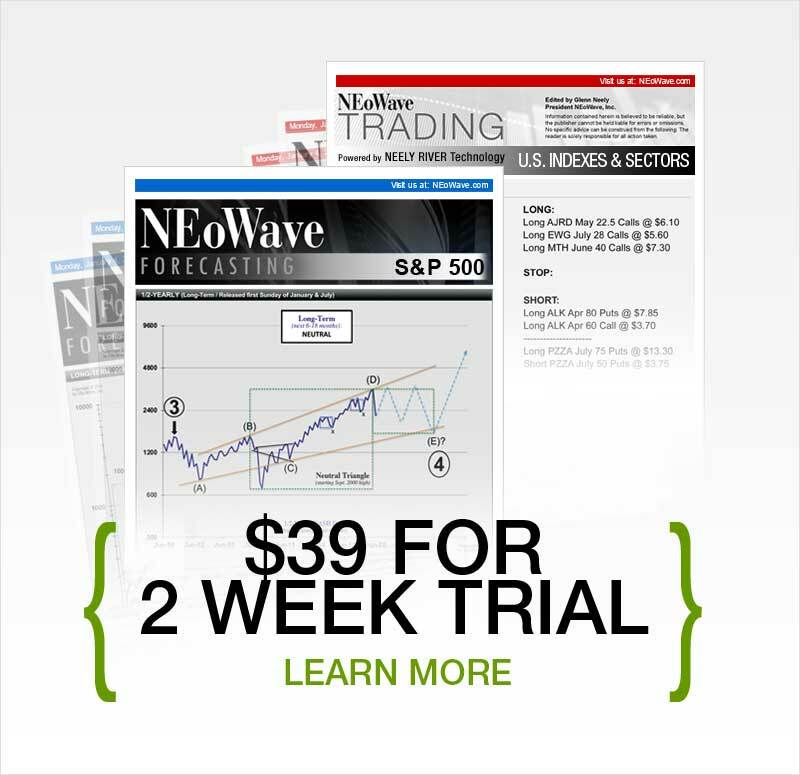 Neely River Trading combined with NEoWave Forecasting is a lethal combo." "Watching you apply your original/unique/brilliant NEoWave theory (with your River channels) to the markets is miraculous. I have researched thousands of books on the markets. Nothing comes close! You are, BY FAR, the best market analyst known to me." "To stand on your shoulders, so to speak, has accelerated my understanding. In all honesty, had I been in your shoes I may have been more selfish with the knowledge." "I truly admire you and your work. I can hardly imagine the dedication and passion you must have had in order to create it. Thank you!" "Thank you for your arduous and time-consuming work to help millions of people. You are way better than your competitors because you are honest and smarter." "Here are revelations from taking your class: Elliott Wave is so primitive, NEoWave is scientific. In NEoWave we mainly focus on behavior of waves, not just structure. But if you start with EW, it is hard to shift to the new concept. Now I am more confident with Wave theory." "I have been reading your book and studying your analysis for the last five months. I think you are brilliant. I have compared your analysis to other Elliott Wave experts, and I have found yours to be vastly superior. I know that with your help and insight I will become very good at NEoWave. Thanks again for sharing your knowledge and wisdom." "I applaud your perseverance and absolutely accurate description of the stock market since the 2003 low. It seems fitting that you are the person who discovered the Diametric formation. It is your excellent description of the effect that has navigated the investment and trading community through its crooked pathway. So, for these reasons and the others that enable you to comprehend the difficulties of markets that are indecipherable to the rest of us, I thank you for your great research."